Leaves: Basal, long-stalked, palmately 3-foliolate; leaflets heart-shaped, 1/4 to 3/4 inch long, 1/2 to 1 inch wide, gray-green, sometimes with reddish spot near base, glabrous, somewhat waxy; margins entire; tips notched. Inflorescences: Umbels, 4-15-flowered, terminal; flowering stalks 4 to 8 inches tall, arising from bulbs. Flowers: Sepals 5, tips orange; corollas funnel-shaped, about 3/4 inch wide, lavender or rose-purple; petals 5, lighter near bases; stamens 10, 5 long, 5 short. Fruits: Capsules, egg-shaped; seeds numerous, reddish brown. Habitat: Moist and dry prairies, rocky open woodlands, thickets, and waste areas. Toxicity: The leaves and stem contain oxalic acid, which can cause poisoning if too much uncooked foliage is consumed. Uses: Several Great Plains tribes fed their horses the crushed bulbs to enhance their speed. 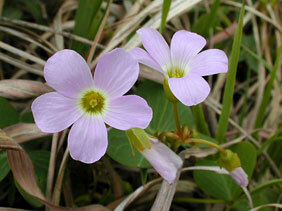 Pioneers were said to have made pies of wood sorrel leaves when gooseberries or rhubarb were not available. Comments: The leaflets fold and droop, and the flowers close at night or on very overcast days. Blooms April to June and occasionally again in September.